At Eurogamer Expo last September, whilst my friends were queuing for (and obviously playing) Splatoon again, I had a little look around the indie section for Wii U and 3DS. 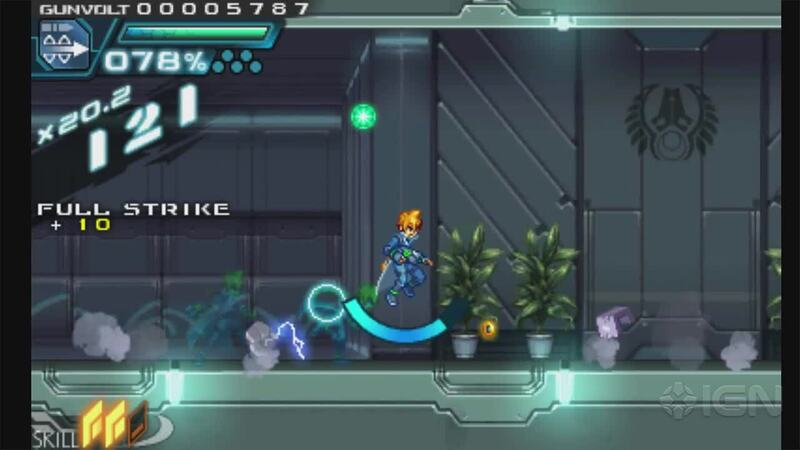 On my journeys, I found a single demo level of Azure Striker GUNVOLT, so I gave it a go. The little game I discovered was amazing, and left me wanting more, but I heard absolutely nothing more about it. That was until the Nintendo Direct on 1st of April, when I found out that it was being released on the 2nd, and also the developer also graciously offered a free copy for me to review. So, I won’t waste any more time. The story of GUNVOLT is a typically insane Japanese affair, but I should say that this doesn’t have a negative effect on the game in the slightest. The opening mission opens with the titular character being tortured by an organisation called the Sumeragi Group for a plot to eliminate a program called “The Muse”, before escaping to blast his way through the whole first level in a Megaman-esque fashion (unsurprising as the developers are the same ones that made the fantastic Megaman Zero series, and the faux-retro Megaman 9 and 10). The plot of the game, I assure you, gets significantly more entertaining and complex as the game progresses, but I don’t want to spoil any aspect of the story. One thing I will say, is that Gunvolt himself is something known as an “Adept” in the plot, and the powers this gives him are a fundamentally important aspect of the game as they form one of the overall gameplay dynamics. 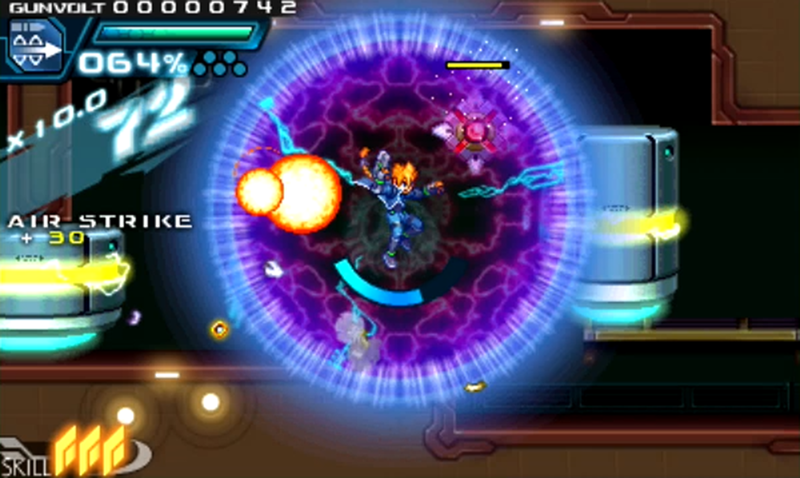 This gameplay dynamic is the “tagging” system, which allows the player to target enemies that can then be specifically targeted with Gunvolt’s “Field” attacks. Actually, I think my earlier comparison of this game to a Megaman title doesn’t quite give it enough credit. It follows the similar gameplay of running from one side of the screen to the other shooting everything before facing a powerful (but differently themed) boss character, but it feels more like an evolution than an imitation. 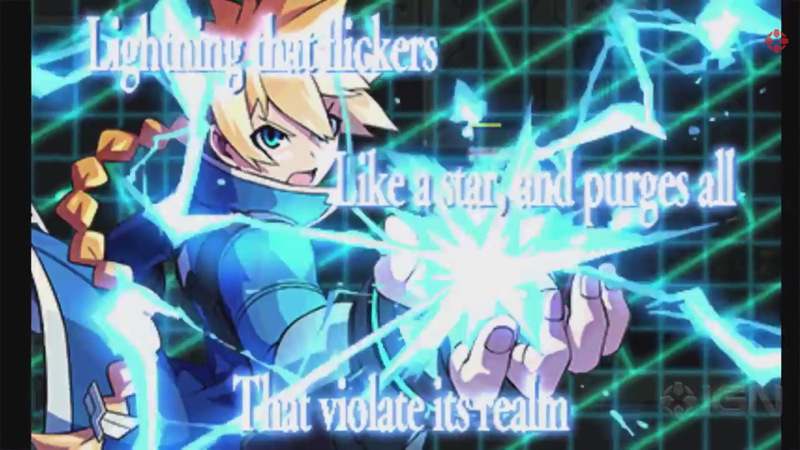 As well as the “tagging” dynamic, which adds a layer of strategy to even taking down the most basic of enemies; many of Gunvolt’s manoeuvres and his “Field” attack consume electricity. This power source refuels on its own whilst not being used, or can be refilled with a quick button press during inactivity, but this once again makes for a genuine threat as overloading yourself leaves you temporarily helpless. As another fun gameplay feature, the game has an accumulative score system builds up a multiplier until you get hit, at which point it resets, challenging the player to get hit as little as possible to keep their multiplier high. If you add to this an item crafting system, optional challenges, and various weapons, items and abilities, you have a game that has incredibly deceptive (and welcome) amount of depth for an indie eShop title. If I were to be given one word to describe how this game looks, I would say ‘stunning’, but luckily I have a few more words than that. GUNVOLT is beautiful game in so many ways; the character models are all unique whilst feeling familiar in their typical anime design, all the locales are wonderfully realised and fleshed out, and the 3D effects on the whole game (especially the electric-based attacks of Gunvolt himself) are some of the best I have seen on the 3DS. The only thing that disappoints me on the aesthetic is the music, and that’s only because it is mostly forgettable, with the track called ‘Resurrection by Lumen’ being my only highlight. That, however, is only a small niggle when faced with how good the rest of the game is. 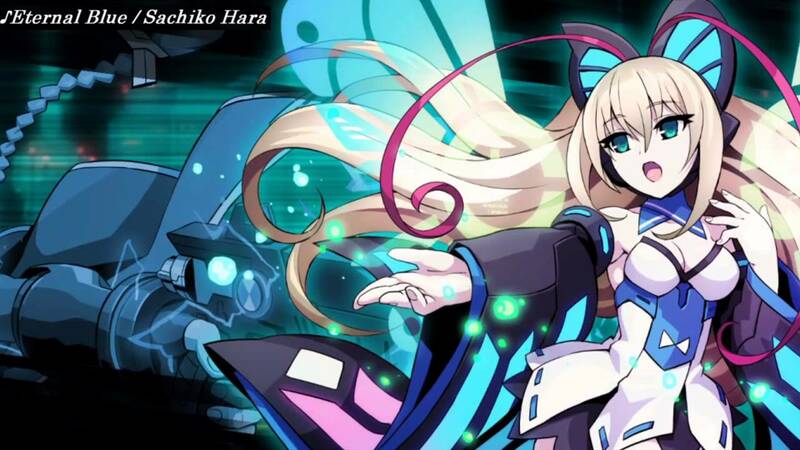 So, should you buy Azure Striker GUNVOLT? It all depends on whether you miss the Megaman of old, or the times when good games were his forte. I would be as bold as to say that GUNVOLT should become the template of what games of this genre should aim to be; deep, beautiful, challenging, and (ultimately) fun. I’d like to end with a thank you to Inti Creates for very kindly supplying the download code that has allowed me to write this set of Impressions. Check in soon for my Impressions of their other eShop release, Mighty Gunvolt.